At Trailer Hitch RV, we offer five decades of experience in the California RV industry. The new Genesis Supreme line of toy haulers is quite exciting to us, and it should be to you, too. If you want to bring all your toys along for a weekend trip or a long-term adventure, one of these may do the trick. Continue reading to see our Genesis toy hauler reviews, as we take a closer look at some of the most popular options in our inventory. This fifth wheel carries a dry weight of 10,980 pounds and an overall length of just over 33 feet. The standard build exterior includes LED flood lights, running lights, and tail lights, along with a rear spoiler. There’s plenty of room inside, with a pair of queen beds and a large master suite that’s luxurious and spacious at the same time. Appliances include a 30K-BTU furnace which can warm up even the coldest of days, along with a 13.5K-BTU air conditioning unit with ducting. Bring the dirt bikes or an ATV and head out on an off-roading adventure for the weekend, with 16 feet, 8 inches of cargo space, along with a full kitchen and bathroom. Friends or family can sleep on the power queen bed while you have your own queen in the master suite. There are two swivel rockers which allow you to hang out and relax before making dinner. Leave the cooking to someone else while you continue relaxing! You may even retire to the back and throw on your favorite show in the living area or bedroom with the standard 32-inch TVs. There are many tie downs available to secure all of your toys, too. After you’ve finished the day playing outside, bring the entertainment and fun inside, with the Genesis Supreme 32 CRXL. The cargo area can be customized, anywhere from 13 feet, 10 inches up to 19 feet, with room for all of your things whether heading out on the trails or hanging back around the trailer. The front private bedroom is a bit larger than the previous models we’ve discussed, with a king size bed and slide out wardrobe. Guests will have space to stretch out on the rear power bunk or roadside sofa bed. The dual entry bath is designed to maximize space, too. With a dry weight of 13,520 pounds and an overall length of 44 feet, the 40 CRXL will have you ready for just about anything. With 19 feet, 7 inches of roadside storage and 25 feet, 5 inches of curbside storage in the garage area, take the toys out for a spin, then store them away and enjoy the peace and tranquility of nature. Appliances include a 15K-BTU air conditioning unit with ducting, along with the 30K-BTU furnace found in other Genesis Supreme models. Optional features include an upgrade to the televisions, as you can choose to have a 40-inch TV instead of 32 inches. If entertainment matters to you, this is a worthy upgrade. If the great outdoors are your true calling, then a 2019 Genesis toy hauler may be just for you. 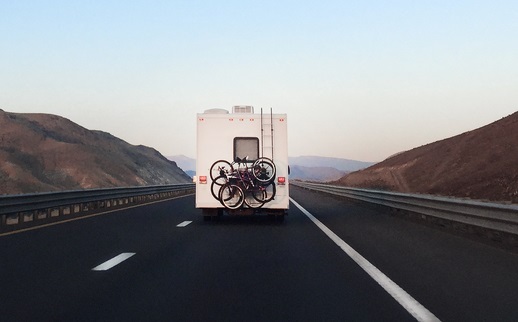 With many of the comforts of a Class A motorhome but also the ruggedness needed to carry toys, these toy haulers are a safe choice as you travel throughout California. Explore the current Trailer Hitch RV inventory of Genesis toy haulers or contact us today to learn more!